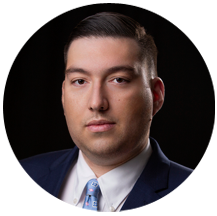 Danny Chrisney is an associate attorney at the Wilner & O’Reilly Fresno office. The son of a Guatemalan immigrant, Danny speaks fluent Spanish. Growing up in the Latino community of Southern California Danny saw how our nation’s immigration laws could shape the lives of those around him. He studied at Brigham Young University where he earned a Bachelor of Arts in Linguistics with a Minor in Portuguese. While at BYU he was involved in the Maya K’iche program. Danny received his Juris Doctor degree from the Sandra Day O’Connor College of Law at Arizona State University where he graduated with Highest Pro Bono Distinction. As a law student, Danny’s studies were focused on Immigration Law and Policy, where he was participant in the Immigration Clinic as both a student and later as the professor’s assistant. While attending law school Danny worked with USCIS at the Phoenix Field Office. There he received a Certificate of Appreciation for his legal research. He was also able to work as a law clerk for the Florence Immigrant and Refugee Rights Project, Children’s Division, a non-profit organization dedicated to providing legal services to unaccompanied minors and other refugees. He worked closely with Indigenous Guatemalan children in the areas of Asylum and Special Immigrant Juvenile Status. Danny was also the Student Direct of the LDS Immigration Initiative from 2017-2018, a joint-project between ASU Law and the Welfare Department of the Church of Jesus Christ of Latter-Day Saints, where law students are able to get hands-on experience helping the immigrant community with intake consultations every month at locations in Mesa and Phoenix, AZ. In his personal life, Danny enjoys collecting vintage electronics and music, and travelling with his family. Danny currently resides in Clovis, CA with his wife and children.